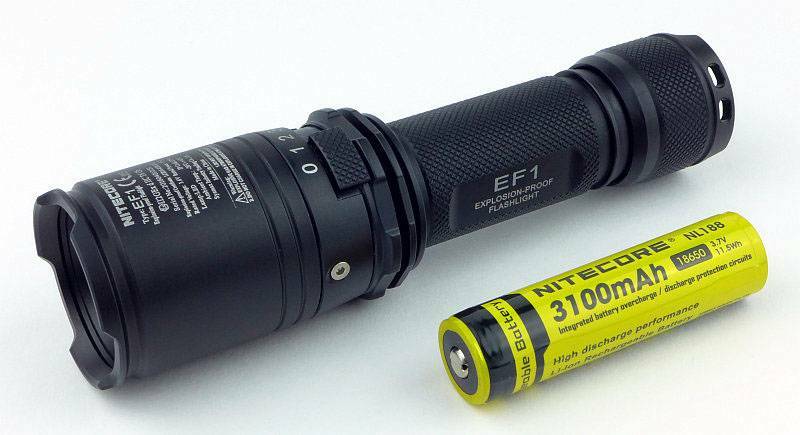 With the EF1, NITECORE have confidently entered the market for hazardous environment equipment, with a light which can be used in the petroleum exploration, petrochemical and chemical industries, as it is rated as a Type II non-mine explosion-proof electrical appliance. 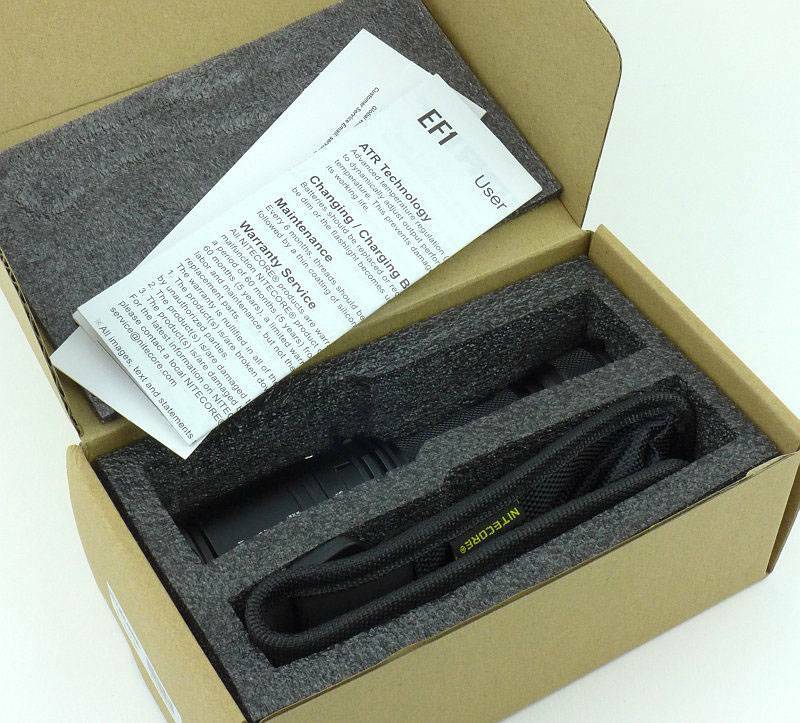 The EF1 arrives in a box like the ones used for the TM series. 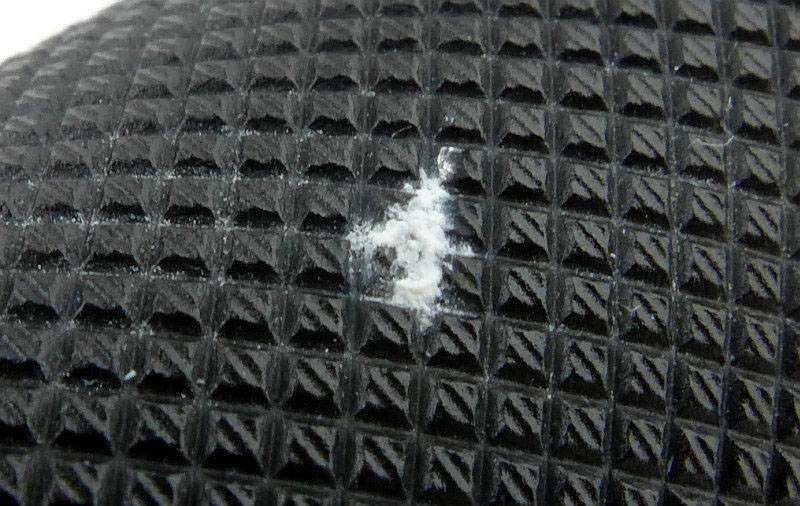 Closed cell foam is used as the liner. 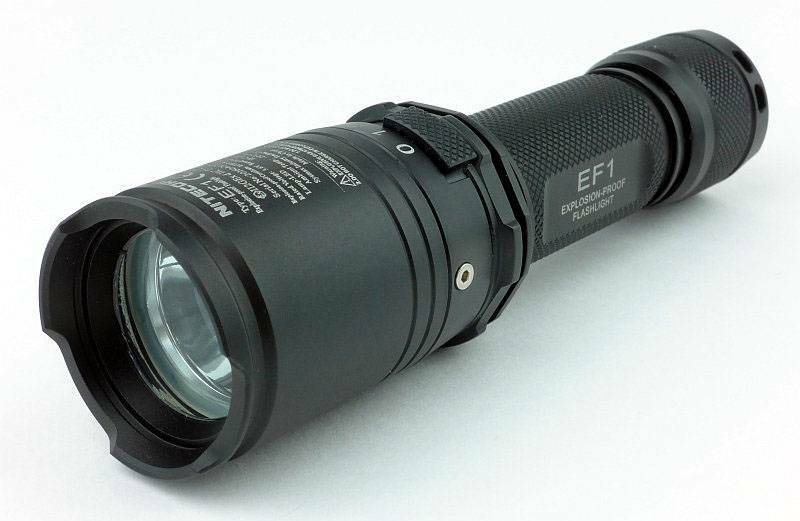 With the EF1 you get a holster, lanyard, spare o-rings and the instructions. 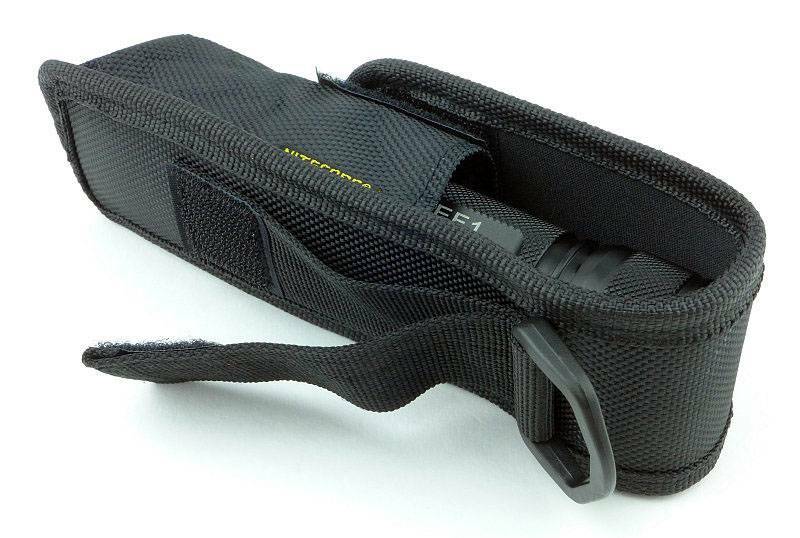 The EF1 in its holster. On the back it has a fixed loop, a D-loop and a Velcro closed loop. 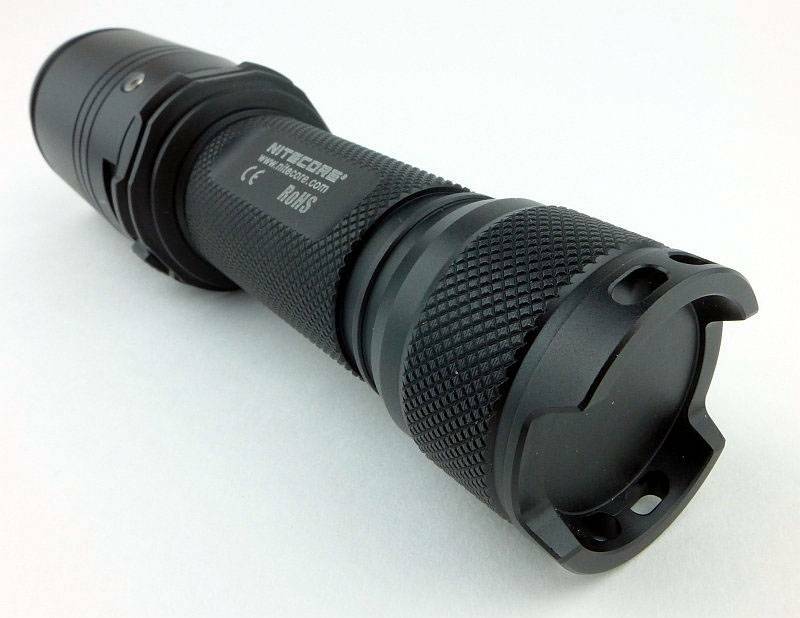 It is a chunky light, but that is due to its heavy build for the Explosion Proof rating. 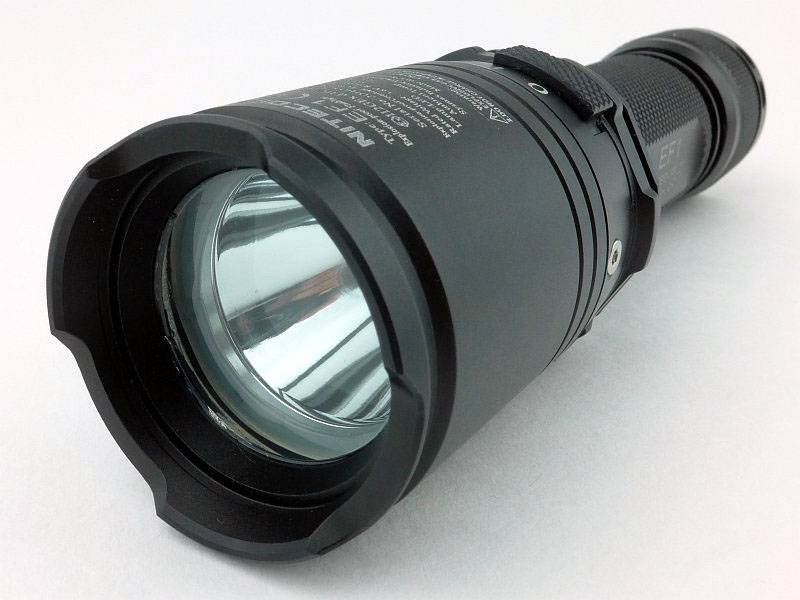 The lens is very thick making it look like a dive light. On the side it proudly states its explosion proof status. There are a couple of exposed screws on the head that seem to hold parts of the magnetic switch together. The switch is a rotating/sliding switch with four positions. 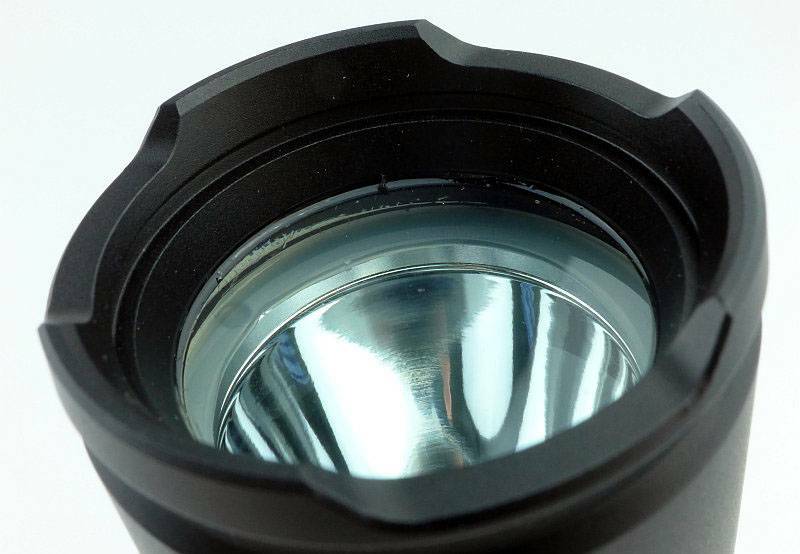 It is difficult to really show how thick this lens is, but it is thick – 10mm thick. A view from the tail-cap end. Inside the tail-cap is a spring and ring terminal. 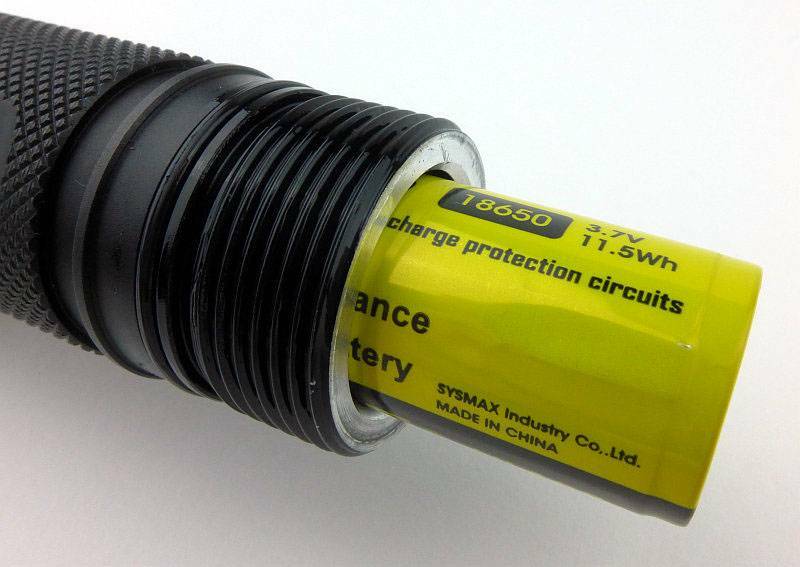 That is one thick battery tube with a minimum thickness of 3mm. 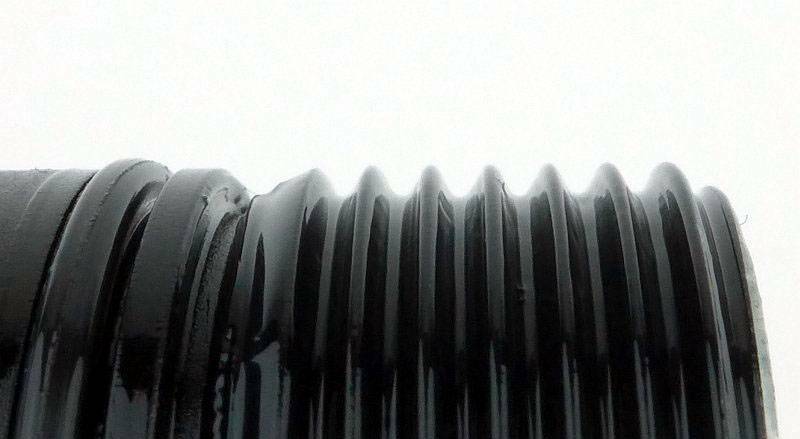 A long section of well lubricated standard threads are used for the tail-cap. 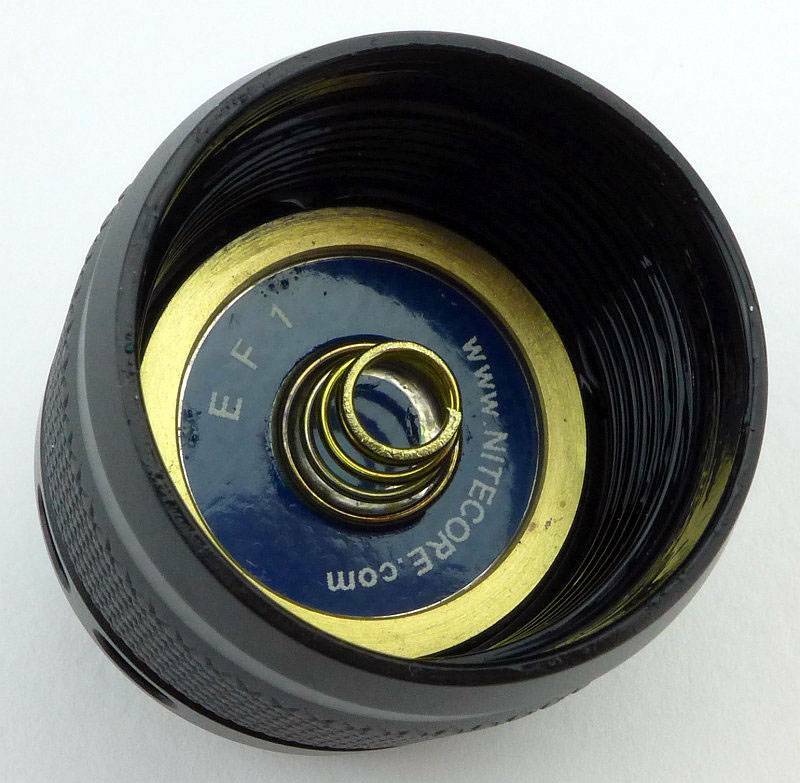 They are fully anodised, so you can physically lock out the EF1 by unscrewing the tail-cap slightly. With a battery being inserted you see how thick that battery tube is. 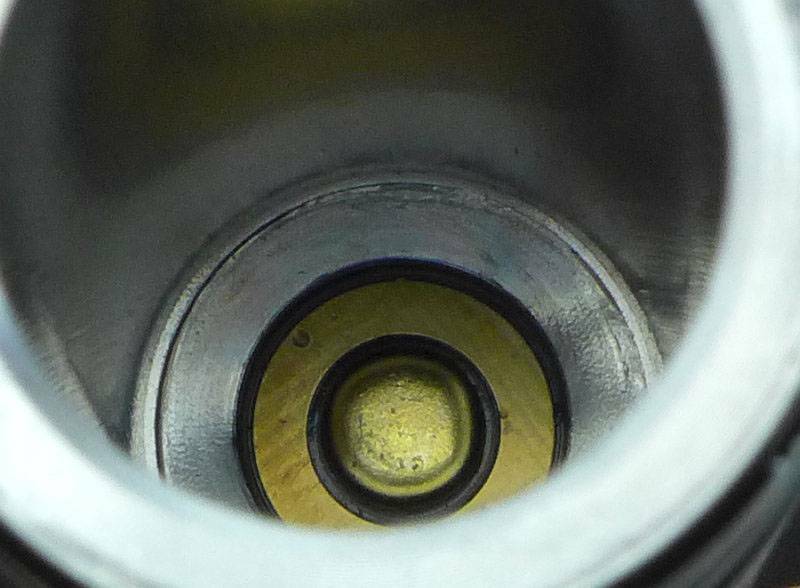 Peering deep into the battery tube for a view of the positive contact. 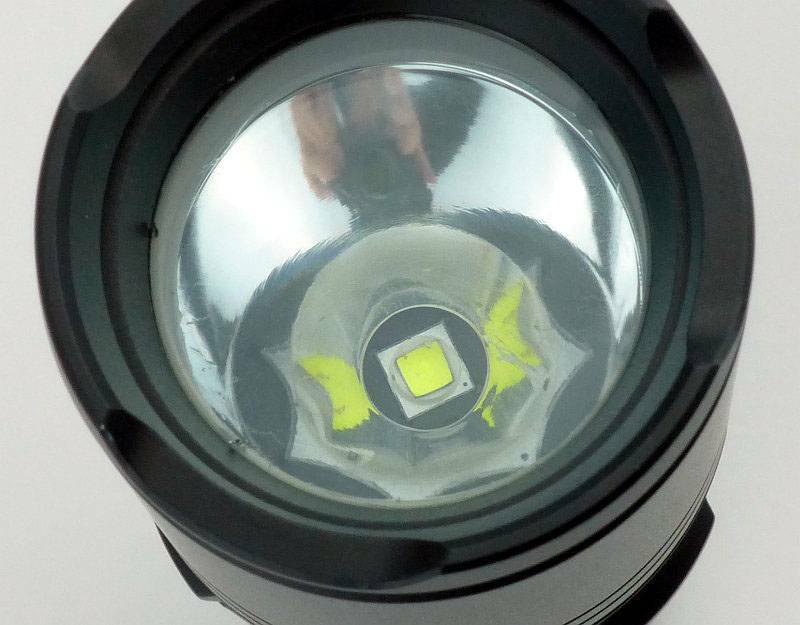 The XM-L2 U3 LED sits in a smooth reflector. 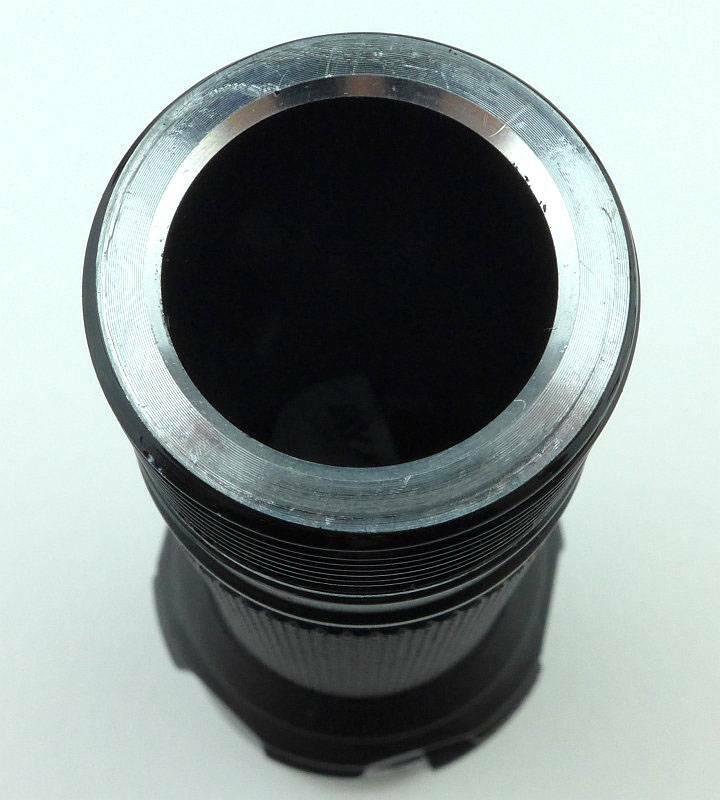 It is a relatively deep reflector to focus the beam. 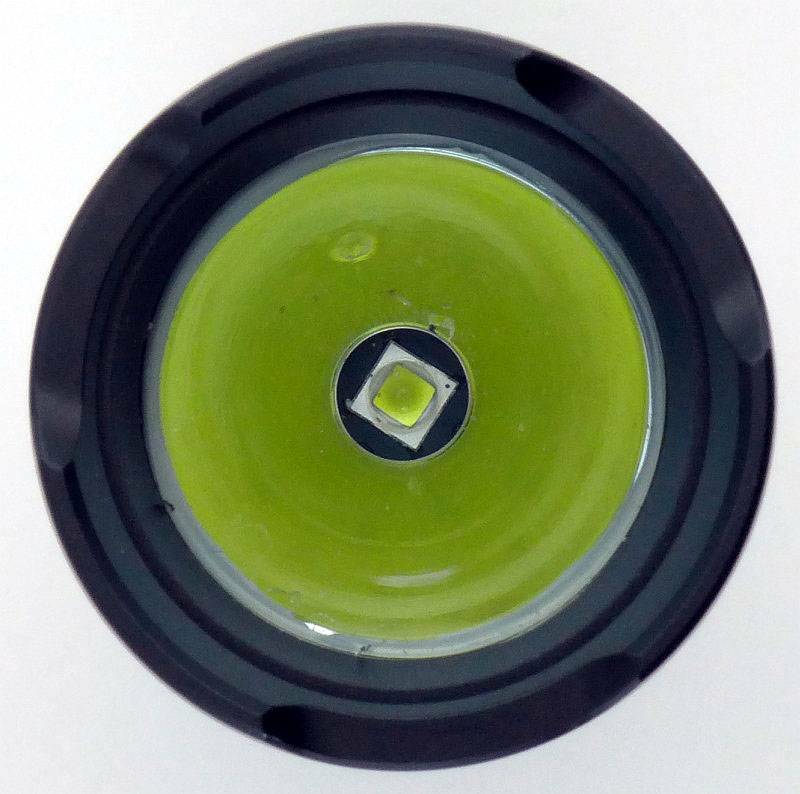 Next to an 18650 cell you can see the heavy build of this light. 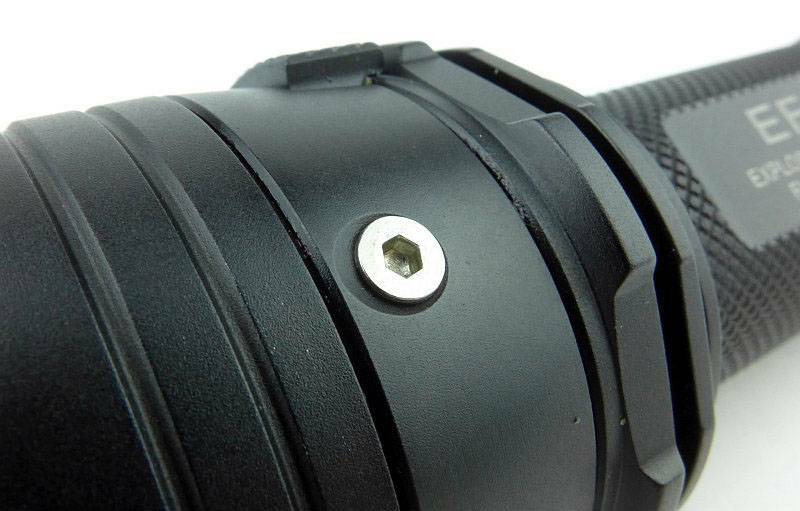 Slightly surprisingly, the head does unscrew giving access to the reflector and LED. This may be to provide access to the o-ring to allow it to be inspected. The detail of those threads for the front part of the light. Starting off indoors, the EF1’s beam is narrow overall. There is a relatively average sized hotspot, but only a very narrow spill around this. This appears much more suited to inspection duties than general lighting for getting around. Giving it some more range outdoors and that narrow spill is still an obvious characteristic. 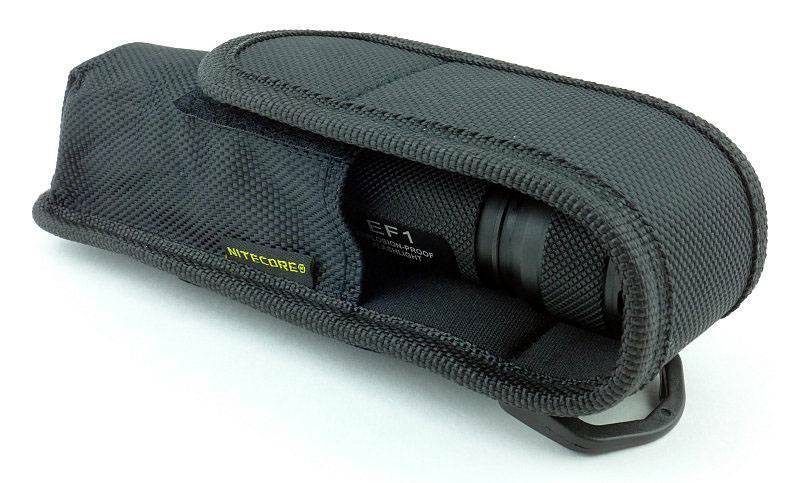 Nitecore have kept the interface of the EF1 very simply. 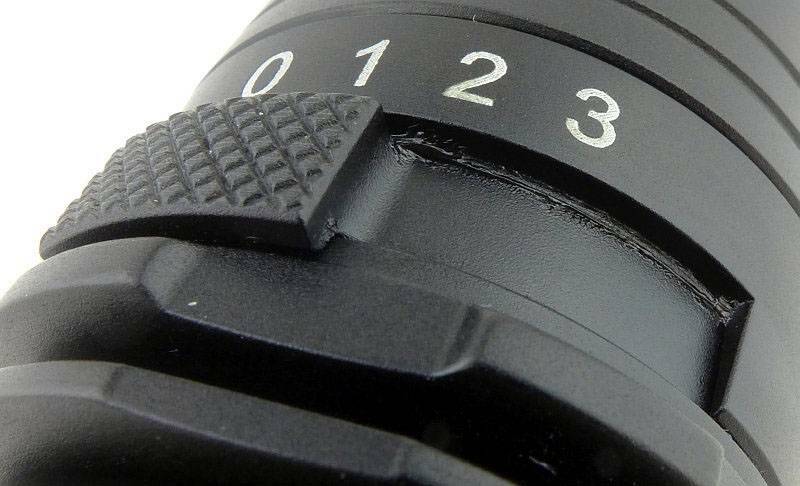 There is a four position sliding switch, OFF (0), Low (1), Medium (2) and High (3). Simply slide the switch to the position you want. There is nothing more to it. 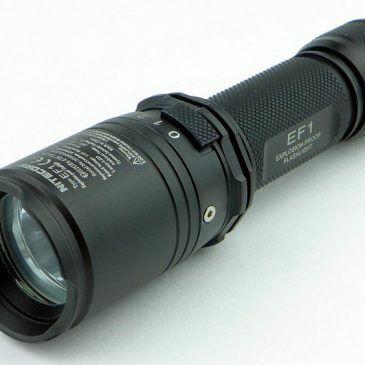 The EF1 runs on either 1x 18650 or 2x CR123. Peak Beam intensity measured 13900 lx @1m giving a beam range of 236m. There is parasitic drain which varies between 2.68 and 1.2 mA. When using a 3100mAh 18650 it will take 48-108 days to drain the cell. This is very bad for a standby light. Initially I was testing the EF1 with an Xtar 3100mAh 18650, but the output figures were not up to specification. 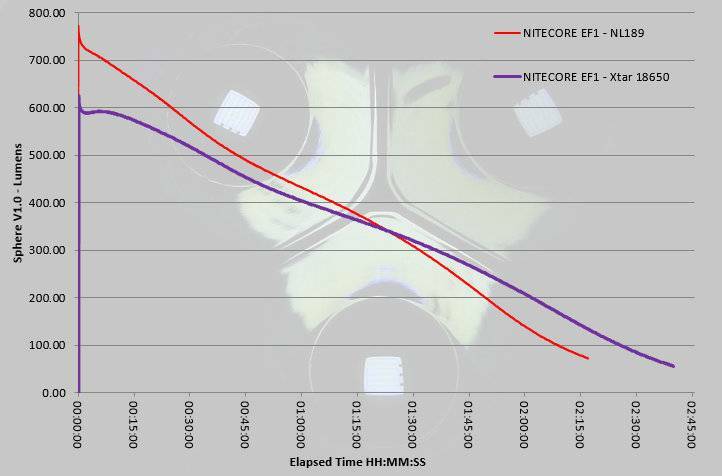 Subsequently I re-ran these tests with a Nitecore NL189. With the NL189 the ANSI output was higher, but as you can see the runtime was overall lower. Output is not regulated and drops off during the entire run. In the environments in which you would use this light, you definitely don’t want a sudden drop in output at the wrong time, so this is a better runtime profile to have. Before we get any further we must clarify what ‘Explosion proof’ actually means. Firstly, it does not mean you can drop a bomb on it! Instead it relates to the world of hazardous environment equipment, for which there are many different and very specific standards for the various classifications of hazard. The safest equipment are ‘Intrinsically Safe’ devices which are intrinsically incapable of igniting hazardous atmospheres even if destroyed, as no component within them can achieve ignition, including the cells. Then there are the ‘Explosion-Proof’ ratings where the device does indeed contain enough energy to ignite explosive gasses, but critically, should the device have been opened in that hazardous atmosphere and contain an explosive mixture which can be ignited, if there is a small explosion within the device, that explosion is completely contained and cannot propagate into the surrounding atmosphere. 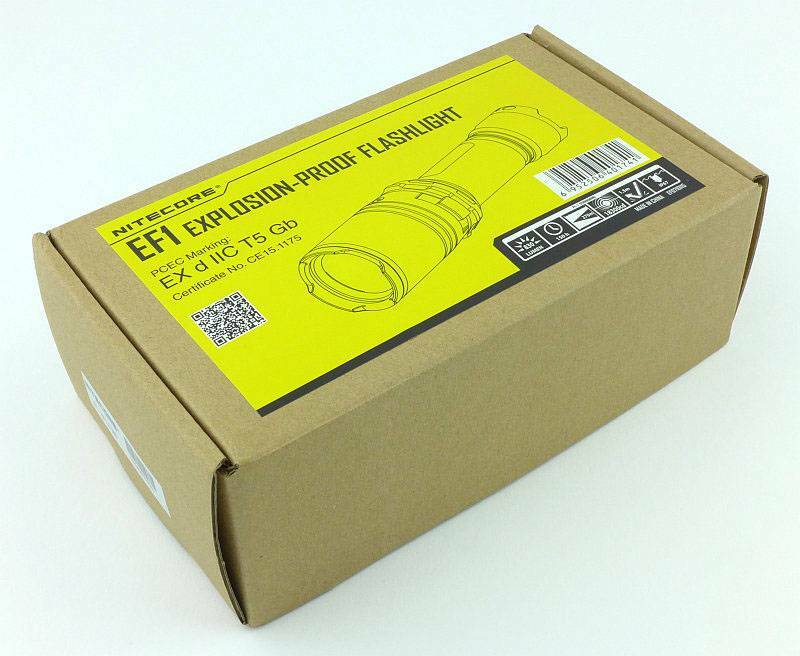 The ‘Explosion Proof’ rating is protection from internal explosions. Now we have got that clear, a direct consequence of the explosion proof rating is that the build is very heavy. 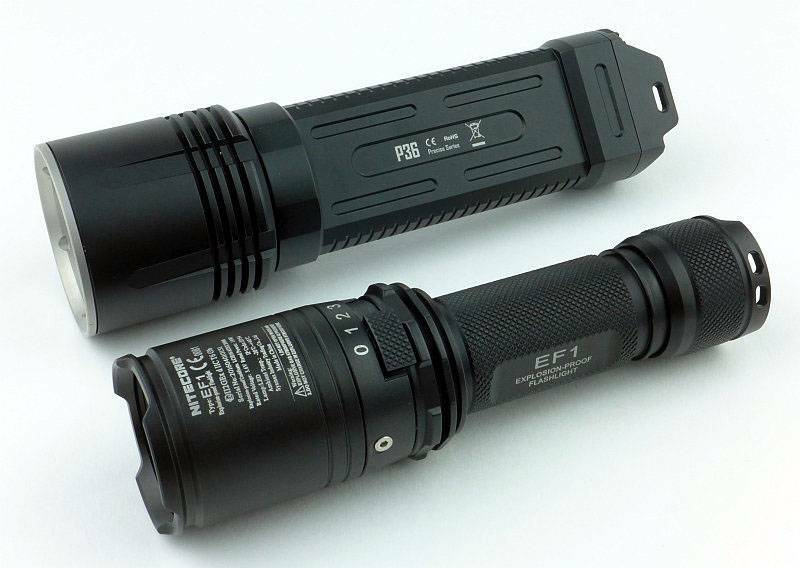 Putting the EF1 next to a two cell light, the P36 shows how even though it is a single 18650 light, it really has presence. We are looking at one very tough light. 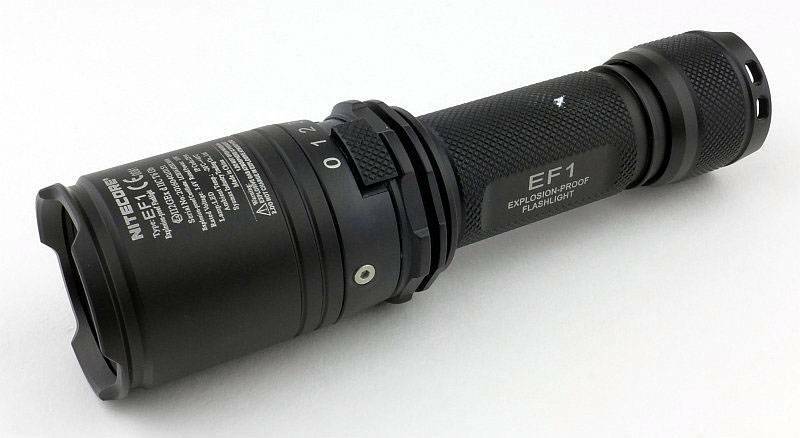 With it being a very solid build, and having a sliding switch, actually the EF1 could also be very suited to diving use. 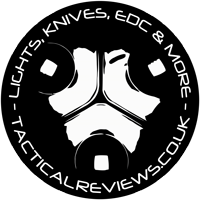 While carrying out my Dive Knives 2016 – Mega Test Review I also took the EF1 with me, but wasn’t able to get any in-use shots. It was ceratinly taken to depths greater than the 1.5m specified, but not more than 10m where I was diving. One thing I did put the EF1 through was the dive knife corrosion testing (details in the Dive Knives 2016 – Mega Test Review) and this is what happened to the EF1. Taking in the overall view, the most obvious sign is a small white patch on the handle. Going in closer we can see this is a patch of aluminium corrosion from the salt water exposure. There must have been a small flaw in the anodising for this to have happened. 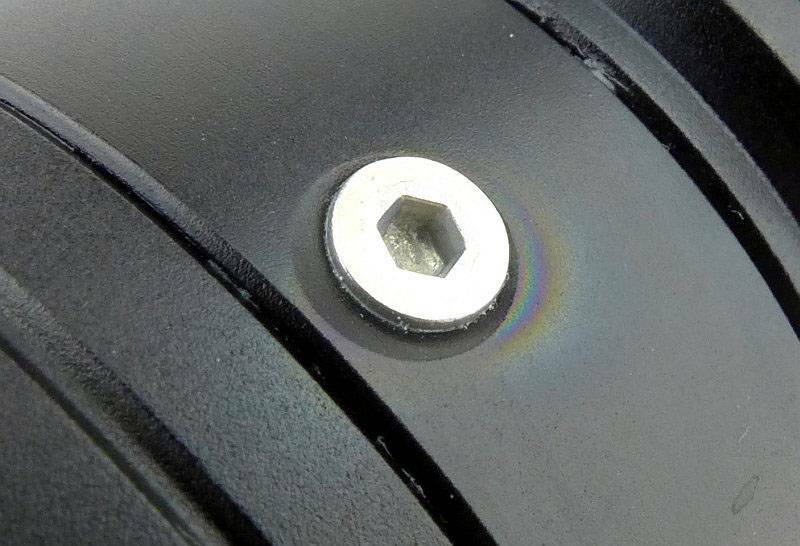 Just next to one screw on the head was a rainbow like colouring on the anodising looking like an oil film. It was perfectly dry and free of oil, and this was only visible after the corrosion test. The last visible effect was that the grease around the sliding switch turned a dark brown/black colour, so was not an inert grease. There were no issues with the EF1 following this intensive corrosion test, and it is still functioning perfectly. 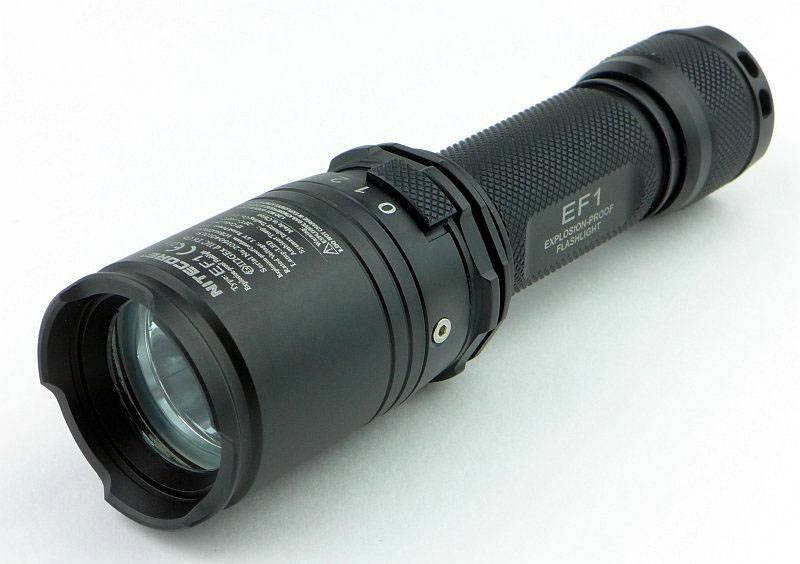 Though we tend to prefer smaller and easier to carry lights, there is a certain satisfaction to carrying the tank-like EF1. Its weight is comforting and there is nothing fragile about it. The slider switch is positive and simple to use and needs no explanation. There is a noticeable delay in the switch response, most notable when switching the EF1 on from OFF. It is probably only 0.3s or thereabouts, but you move the switch, then the EF1 turns on after that brief pause. The same when changing levels. For my own use, the biggest issue is the mode spacing. 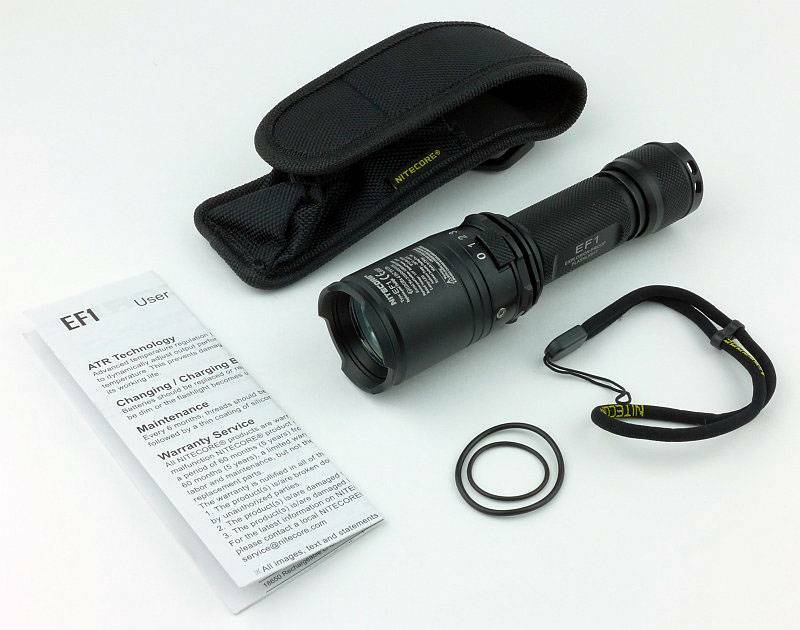 It has a useful 5lm Low mode, but then jumps to 341lm. It definitely could have done with something around 80lm-100lm mark instead of jumping right up to 340lm. When the 5lm is not enough, that jump can be blinding. Not working in a hazardous environment myself, I can’t say if the beam profile is a good fit for this type of use. It certainly seems to be an inspection type of beam rather than one for general use and getting about. I found it too narrow for navigating on rough ground as the hotspot was giving peripheral blindness when shining it at the ground. It is fine for longer distances, just not good closer up. For the domestic user, there is the attraction of the Explosion Proof rating particularly in case of gas leaks. 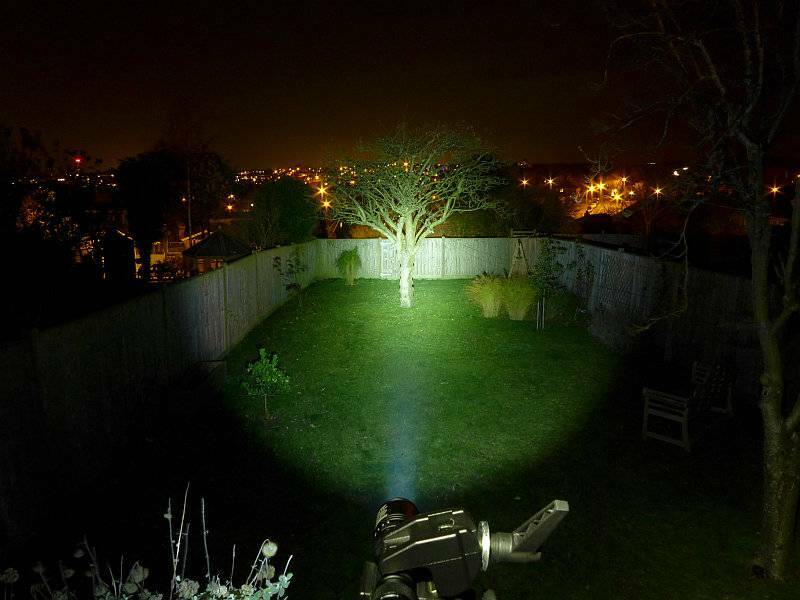 Personally I have several gas-safe lights including intrinsically safe lights. 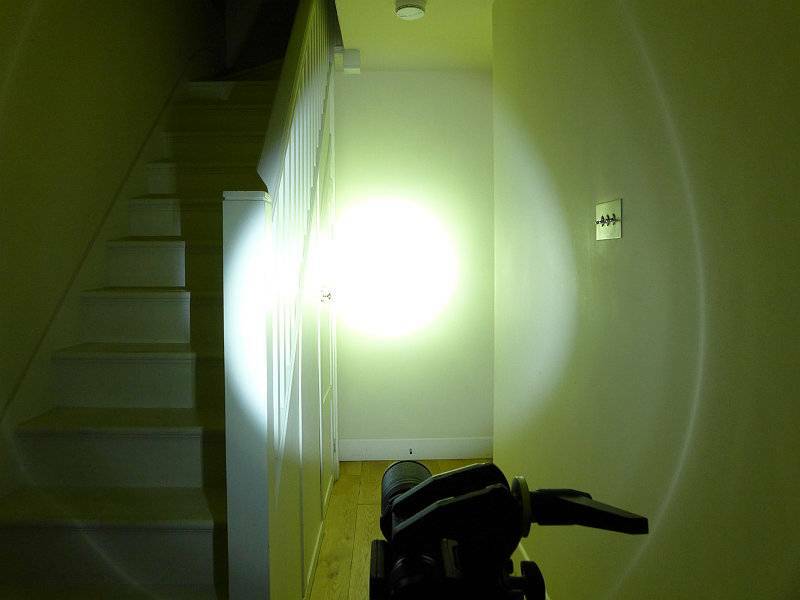 Those intrinsically safe lights however are all AA Alkaline powered, so the EF1 with its Li-ion power means the output is much higher, and I would consider it totally safe to use in a domestic gas leak situation. 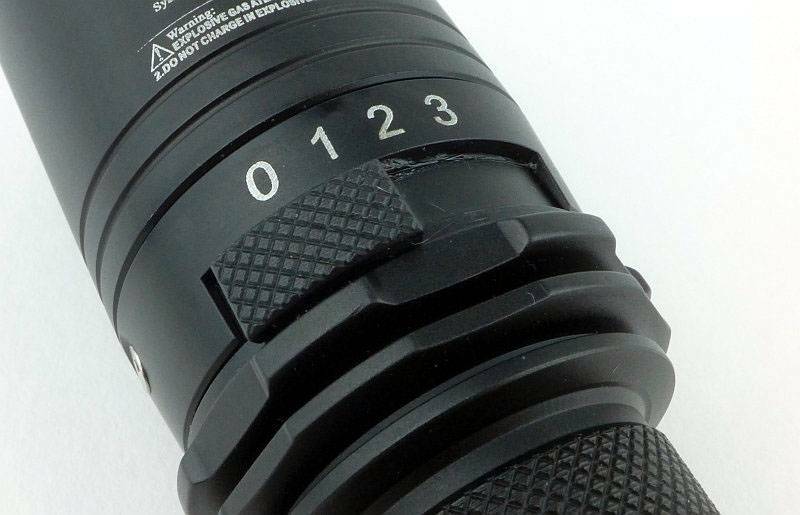 Some users would argue that any waterproof light will be safe to use, but this is wrong. 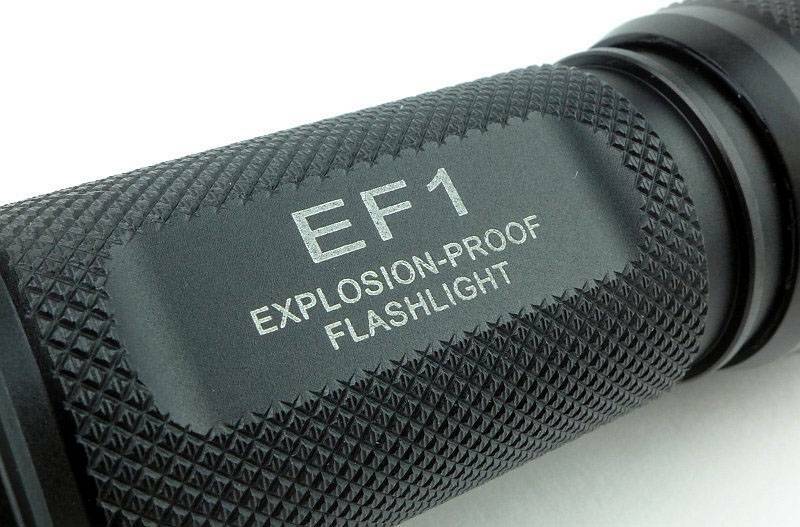 If you change the battery and the explosive atmosphere gets inside the light, turning it on could create an explosion that would break out of a normal waterproof light. It would have been fine if you hadn’t opened it, but you did. With the EF1 this would not matter, as if this internal explosion did occur, the EF1 can withstand it – I know what I’d rather be holding. Explosion Proof rating. Big jump in output from Low (5lm) to Medium (341lm). Simple sliding switch. High parasitic drain – remember to lock out the tail-cap. Predictable gradual drop in output (no sudden cut-out). Narrow spill limits versatility. Extremely solid build. 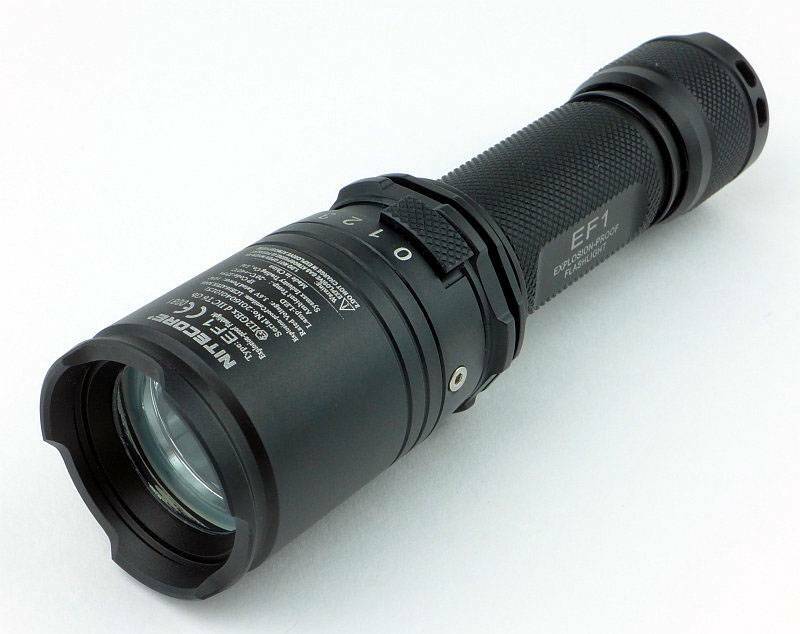 PWM used on Medium and Low modes.